It seems like every time we turn around the 13th of the month has crept up on us again, announcing itself with a slight, yet disturbing odor that soon becomes unavoidable. 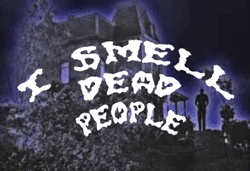 So welcome back to ISDP, the monthly digest of foul smells that invariably lead to the darkest of discoveries. As they say on cable television, VIEWER DISCRETION IS ADVISED. Here at ISDP the common impulse is to feel sorry for the victims. But not always. The discovery was made when “an off-duty police officer smelled a foul odor coming from a car.” The deceased had apparently taken his own life. Three weeks later the same reporter, Alicia E. Barrón, filed another report of bad smell leading to the discovery of a body in a car trunk. (This makes Barrón the leading candidate for this year’s Peeuuwlitzer Prize in ISDP journalism.) The second incident happened in Glendale, Arizona. A maroon Mitsubishi with Illinois plates was abandoned in front of a foreclosed home. Richard Ozenbaugh, one neighbor, tells 3TV, “What tipped us off . . . something leaking . . . went over, pretty rank and I said ‘No this isn’t good’.” He called police who also noticed the smell, opened the trunk, and found a body inside. Residents of an apartment complex in southwest Houston, Texas called the cops about “a foul odor” coming from one of the units. Inside the officers found the bodies of a 43-year-old woman and a 67-year-old man, both dead of gunshot wounds. Police suspect a murder-suicide. In Memphis, Tennessee, cops respond to tenant complaints of a “foul smell” and are led by the nose to an eighth floor apartment where they find the bodies of a couple who had lived there for about two years. Neighbors heard them arguing recently. Chalk up another one for Florida. Sheriff’s deputies found a decomposing body in a “small white house” in Orlando on May 31 after residents complained about “a strong smell” coming from the place. A body was found today at a Las Vegas motel by a construction worker who noticed a foul smell coming from one of the rooms, police said. “When it comes to dealing with what we do on a daily basis, if sights and smells bother you, this is not the profession for you,” Gerhard said. Sage career advice from a guy who ought to know. nothing smells worse than rotting perv. Cops usually hate dealing with DBs. But in this case he gets credit for a collar and closes a case.